Members of the World Champion 1948 Cleveland Indians (Bob Feller, Lou Boudreau, Tris Speaker, Hank Greenberg, Satchel Paige, Gene Bearden, Bill Veeck, et al.) 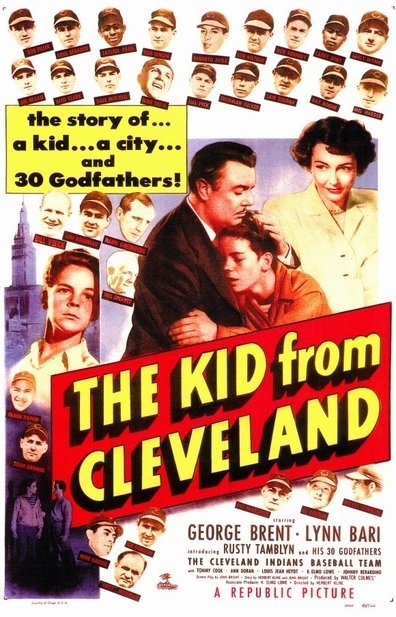 come together to help a troubled teenage fan (“Rusty” Tamblyn) in THE KID FROM CLEVELAND (1949), a shot-in-Cleveland Republic Pictures rarity that features footage of League Park, Municipal Stadium, and the Cleveland Museum of Art, among other local landmarks. It will show on Thursday night only. Preceding it at 7:00 pm will be “The World Series 1948,” a vintage 40-minute newsreel featuring the Indians and the Boston Braves. Arrive on time and be eligible to win one of two special prizes provided by the Cleveland Indians, including an autographed color photo of Grady Sizemore! Shot in Cleveland with 1948 Cleveland Indians! This entry was posted in cleveland, film, ohio and tagged art news, CIA, Cinematheque, cleveland, film, ohio, show. Bookmark the permalink.